Home» FAQ » How do I change the name of my blog? How do I change the name of my blog? I am new to the world of WordPress and I have a blog that I have not messed with much. The whole thing is a little daunting to me. Anyway, I would like to change the name or title of my website. I am not sure how to do this or if I can even. I have seen you a few times on creativeLIVE and followed you on YouTube. You have a lot of valuable information to share. I also enjoy your witty sense of humor. I appreciate your taking the time to help me. Thanks for the kind words. If you need to change the URL of your website, that can be challenging, but if you just want to change the title as it displays in the pages of your WordPress site, you can do that in the General Settings quite easily. As you can see in the screenshot below, just log into the Dashboard, click on the Settings link on the left and choose General. The Site Title and Tagline are the first two fields. 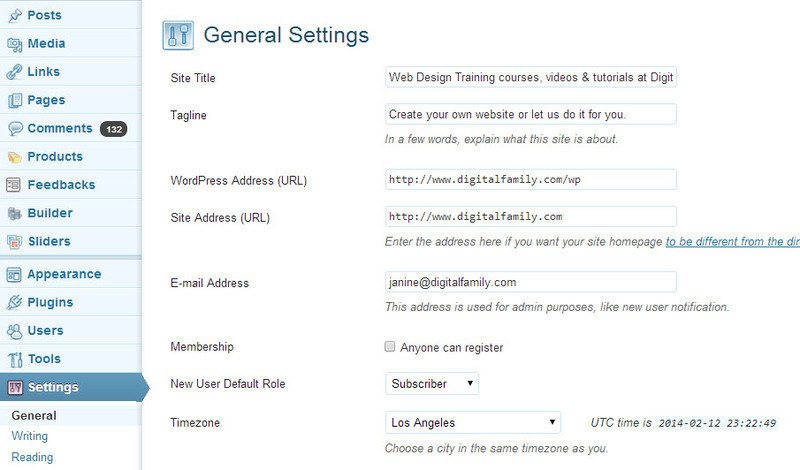 You can use the WordPress General Settings to change the title of your website or blog.